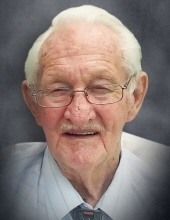 Richard C. “Rocky” Eddings, 91, De Pere, passed away peacefully on Friday, October 19, 2018. The son of Frank and Vera (Meglemre) Eddings was born in Bayard, Nebraska on September 10, 1927. Rocky met Betty Jane Lemke in Milwaukee while on leave from the Navy in 1944. They married August 11, 1946 in Bridgeport, Nebraska. They loved square dancing, traveling together and cruising the open sea on cruise ships. The Heavens gained a gifted square dance caller to keep them all dancing. Richard is survived by his wife of 72 years, Betty; their children, Richard J. (Colleen), Janesville, Melody (Bruce) Williams, De Pere, and Rory (Victoria), Texas. He is further survived by his grandchildren, Melissa (Wayne) Linssen, Melinda (Kevin) Mommaerts, Diane Eddings, Maranda (Dave Fischer) Miller, Brenda (Tony) Dicristina, Meredith (Chris) Johnson, Sarah (Vern) Short, James (Kendra) Eddings, Steven (Yolanda) Eddings, 26 great-grandchildren and 19 great-great-grandchildren. He is even further survived by his sister-in-law, Tanya (Paul) Salfer. Richard was preceded in death by his parents, Frank and Vera, siblings, Darlene (George) and Betty (Mark), and sibling-in-law Warren Lemke. Family and friends may visit at Faith Chapel, 800 High Meadow Ct., Green Bay, beginning at 1:30 p.m. on Sunday, November 4, 2018. A Memorial Service will begin at 3:00 p.m. with Pastor Dylan Valliere and Pastor Doug Shilts officiating. Full Military Honors will follow. To send flowers or a remembrance gift to the family of Richard C. Eddings, please visit our Tribute Store. "Email Address" would like to share the life celebration of Richard C. Eddings. Click on the "link" to go to share a favorite memory or leave a condolence message for the family.